The figure could show not selected options and equipment ranges. High-value camera-mounting with a low- friction height adjustment including an adjustable light system with 150 Watt for optimal illumination. The cameras and the light system are mounted on a fixed leveling arm and therefore are always in the correct orthogonal position. The height and the position of the camera as well as of the light system are infinitely adjustable. The guide post fixed on a massive ground plate, is 1,5 meter high and thus offers the possibility to examine the subject from all perspectives without distortion. The offered standard system allows the mounting of one camera and 1 light system. A second infinitely adjustable leveling arm is optionally available (additional costs) for mounting an additional second camera. The Camera is NOT included in the delivery. Digital cameras available on request (extra charge). Attention! 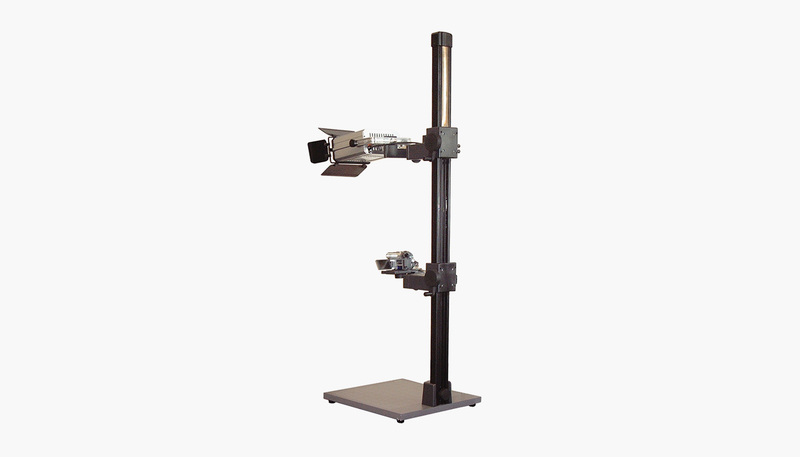 Due to safety reasons and for distortion free video recording a safety zone of at least two meters between the running machine and the camera fixation is required.